We are proud to offer you a luxurious vacation experience in our registered heritage building. The oldest commercial property in Annapolis Royal offers you all the modern conveniences that vacationers expect. Located in the heart of Annapolis Royal, recognized by MacLean's Magazine as one of the "10 PLACES YOU'VE GOT TO SEE" in Canada. Within walking distance you can dine in cafes, bistros, pubs and fine dining establishments. In addition, live theatre, a farm market, internationally acclaimed graveyard tours and national park are nearby. Upper Clements Theme Park, Adventure Park, Annapolis Royal Golf Course and Annapolis Historical Gardens are within a 10 km radius. Visit annapolisroyal.com for more information regarding local attractions and events. 1100 square feet of living space, with an additional 230 square feet of outdoor living, provide vacationers with all the comforts of home. SMART TV, wifi, and USB charging ports keep you connected. I purchased this property because it has the best of both worlds. Located in the center of town, the rear of the building boasts one of the best water views in the area. 239 St. George Street is considered the oldest commercial building in a historically significant town. While maintaining its historical character, this property boasts all the conveniences and luxuries travellers expect. Luxurous 4' x 4' shower with rainhead and handheld shower heads. Located in the centre of town, all conveniences are within walking distance. View the Annapolis Basin from the deck. Spices, aluminium foil, plastic wrap, paper towel, napkins, detergent, corkscrew, electric mixer, knife block. Dishes and cutlery for eight. Bowls, pots, pans. Brand new, high efficiency, slate finish appliances. Located on the second floor, accessible by outdoor staircase. Beautiful apartment in a beautiful spot! This apartment is lovely - completely renovated with great attention to detail. It was a pleasure to call this our home away from home for a long weekend. It's located in downtown Annapolis Royal and we could walk everywhere. The view from the deck and the living area was simply stunning. I loved watching the tide come in and out. Thank you Tracy for an amazing stay! What a great vacation we had in the picture perfect little town of Annapolis Royal. The apartment is beautiful inside and out. So comfortable, spacious and modern, while still in touch with its historical side. Having your own parking spot right outside the apartment is a bonus. The deck! What can I say? I'm still thinking about relaxing on that deck days after departing...and I'm sure I will for a long time to come! So many sights to see in the area and this is an ideal spot to take day trips from. Wonderful dining choices all within walking distance and the whole town of Annapolis Royal is delightful to tour on foot. Tracey was very pleasant to deal, making the booking process smooth and responded to our questions promptly. A thoughtful goody basket waiting inside the door made us feel very welcome indeed. Tracey....your place is exactly what you stated and extremely beautiful. From the moment we arrived it felt like home! Your welcome basket was a pleasant surprise buy very much appreciated after the 10 hour drive we had in the rain. We stayed 8 nights and didn't see another drop of rain which allowed us to do a lot of hiking and sight seeing. We emailed you asking for "must do's" and we are so happy we did. We did every one of your recommendations and have the beautiful pics and memories to cherish forever. The view from the deck is beautiful and peaceful!! We didn't want to leave and we are already talking about our next trip back! Tracey...you are the best host we have ever had and can't wait to come back. Annapolis Royal is a beautiful little hidden secret! Newer 2 bedroom (linens supplied) apartment upstairs (many stairs) above shops on the main street of Annapolis Royal. Beautifully remodeled. Galley kitchen with all appliances. Washer and dryer in the apt. Spacious bathroom with great shower - no tub. Comfy living room with excellent TV and wi-fi. Parking is provided off the street behind the building at the base of the stairs. And the view! Step out on the deck for a spectacular view over the Annapolis river basin. Steps to the town boardwalk along the shore. Minutes walk from Fort Anne on one side and the town stores, boutiques and galleries on the other. BBQ is provided on the deck. The town also has many fine restaurants - including an excellent one next door. 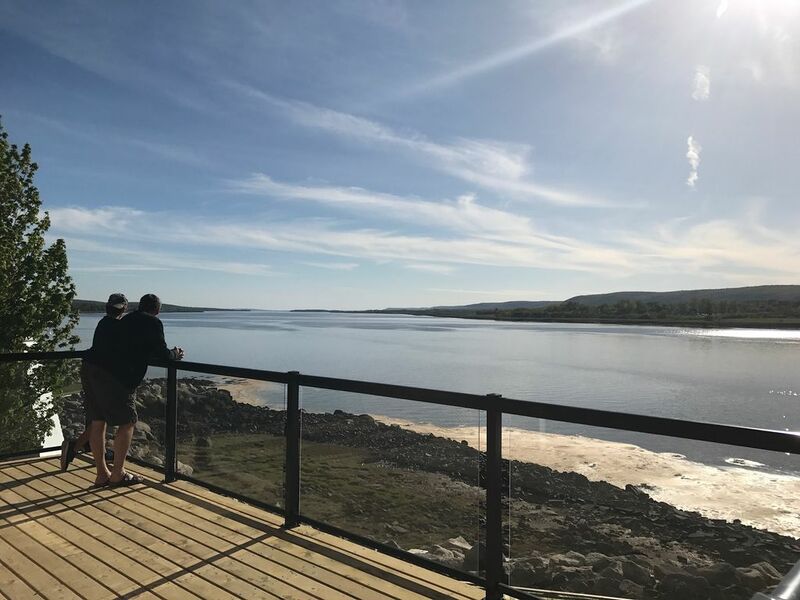 With so much to do in the Annapolis valley and Fundy shore - wineries, whale watching, historic sites - this is a perfect spot to launch your adventure and then return for a relaxing sunset on the deck. If we return to Annapolis, we will surely try to secure this apartment. Enjoy! My daughter and I stayed in this beautiful apartment for a week and it was perfect for us. The location is great, the view from the deck is awesome, the apartment is tastefully decorated and has everything you need. There was a nice welcome basket waiting for us when we arrived which included a bottle of Nova Scotia brewed beer. Annapolis Royal is a beautiful town with lots to do locally and in the surrounding area. Would highly recommend this apartment to anyone coming to Annapolis Royal. Kent, I’m so glad you enjoyed your stay. Please tell your daughter I enjoyed her sweet note. Come again anytime!! Beautiful apartment. We wanted for nothing! Apartment was beautiful. It had everything and more than we could possibly ask for. Beautifully decorated as well. Perfectly situated in the middle of town and right on the river! I highly recommend this property! !